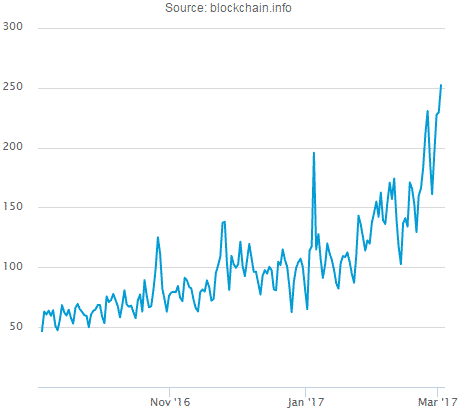 As many of you might be aware, the Bitcoin network has recently been struggling to keep up with the number of transactions being sent each day. This has resulted in some transactions taking considerably longer than usual to be confirmed by the network, as miners choose only to include transactions sent with the highest of fees. A few months ago, in an effort to ensure that your funds confirm as quickly as possible, Bitify made the decision to increase the fee we pay when sending your transactions. This cost was absorbed by us and had no effect on our users except for transactions confirming quicker. Unfortunately many other businesses followed suit, pushing fees even higher, to the point where some transactions are again taking many days to confirm when the network is under heavy load. Over the last 3 months the amount paid in network fees by Bitify totals more than our previous 3 years combined, yet we find ourselves needing to increase the network fees again in order to compete with the current congestion on the network. To allow us continue to provide our customers with a great service and acceptable transaction confirmation times, we regret that Bitify can no longer continue to absorb the increasing network fees required by the Bitcoin network. As a result, going forward Bitify will deduct the network fee from all amounts sent to sellers/buyers. This network fee will be adjusted in line with the current Bitcoin network load, meaning that the fees you pay will reduce when the Bitcoin network is quiet, and increase when it is busy. At all times Bitify will pay the Bitcoin network the recommended fee in order to include your transaction within 5 blocks (50 minutes average). – The final amount charged by Bitify will include a network fee, deducted from the amount sent. – Sellers will be charged 2.5% or 0.001 (whichever is higher) + network fee. – Buyers requiring a refund will additionally be charged a network fee, deducted from the refund amount. – The network fee will be calculated at the time the transaction is sent, and will be relative to the current network load. The Bitcoin core client can only estimate the current fee required per KB of data in order to be included within our required time frame of 5 blocks. This is the rate at which we will apply fees when sending transactions. However we cannot calculate the exact fee required on a particular transaction before the transaction is sent. Therefore the network fee amount we will charge users will be calculated as the average charged to us by the network over the previous 25 transactions. This will mean that the actual fee paid by us to the Bitcoin network will vary slightly from the network fee we charge you, but since this can be higher or lower, on average this variance will be negligible. We regret that we have had to make this change, but unfortunately it is no longer sustainable for us to absorb the network costs whilst keeping our low fees. On the plus side! You will no longer have to wait more than 5 blocks for your transaction to confirm.